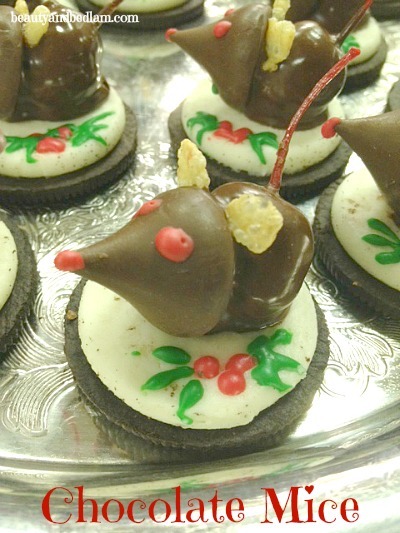 Our Children’s choir concert reception stirred when these adorable Chocolate Mice were presented, and although these were pipped with holly for the Christmas season, they sure would be cute any time of year.I mean who doesn’t love a chocolate mouse? They are a conversation starter on any holiday plate, but unfortunately, they were gone in minutes. You can see why. This is one of those recipes that’s more fun to make with a friend or your children. They are so simple, yet takes a bit of worth while extra time. 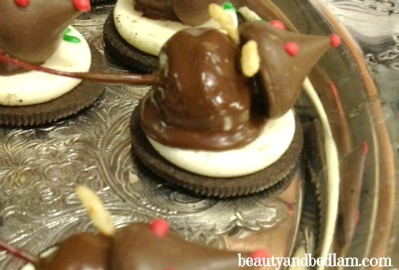 Summary: These adorable Chocolate mice add such a fun twist to any holiday party. Line a cookie sheet with wax paper to set the mice on before starting. Carefully twist cookies apart; set aside the halves with the cream filling. Save the plain halves for your eating pleasure. Melt chocolate chips and shortening in Microwave (about 50-60 sec.) Stir until smooth. If you use chocolate bark, you do not need shortening when melting. Holding each cherry by the stem, dip into the melted chocolate and shake off any excess chocolate. Place on the cookie and add the kiss, pressing the kiss into the cream of the cookie base. Make sure when you position them, the tail hangs over the edge. (Optional: To make holly leaves, pipe a green “v” and add red berries. Pipe red eyes and nose on each chocolate kiss or if you aren’t doing the additional red and green piping, just use toothpick and dip in melted chocolate. Add browns eyes and dotted nose. The ideas you come up with for Christmas cuties is just too much! And so simple!! I love, love, love it!! Thanks so much for the adorable inspiration! These are so cute. My daughters just finished performing in The Nutcracker and these would have made a cute gift for the “mice” on our list. These are so adorable and I’m sure pretty tasty too!